The before on this piece is unrecognizable compared to how stunning this one turned out! This is a solid maple high quality 7-drawer dresser needed sanding, repairs, some Early American stain and a whole new paint scheme with my newest color obsession – Queenstown Grey in the General Finishes Milk Paint Line. The color is a rich charcoal that almost has navy undertones, but could also fit into a warm-toned color scheme alongside tans, ivorys or browns. Expect to see a lot more of this color – I immediately ordered more for a hutch we are working on – because this will accent any home perfectly. The hardware is original with a rustic light bronze look. I had the pleasure of refreshing a stunning authentically antique church pew for some clients in the next town over. This client knew she loved this piece she had found in the Eastern Prom of Portland in their new country-setting home, but wanted it to have a refreshed look. She sent pictures and I created an inspiration board to see which direction we might take the project. Once we decided to strip and lighten up the base wood and paint the edges with some light distressing I got to work on stripping the decades of deep-set varnish, chiseling away the hardened gum that church-goers had stuck under the bench and revealing the stunning worn spots where so many of the faithful had perched themselves. It was a ton of work to get this down to raw wood and incredibly satisfying. We used a special oil-based highly durable non-amber-ing varnish for the bench seat knowing the function this will serve and then the ends got white General Finishes milk paint, light distressing and a few coats of High Performance Satin topcoat. We delivered this piece back into a freshly painted cheerful front entryway the day before they hosted a party and we hope that it continues to be a cherished piece in their home for years to come with its new lightened-up look. Our very good friends came by this family trestle table that is the perfect size for their remodeled kitchen, but the dark stain wouldn’t fit in their bright kitchen. We sanded it down raw and gave it a grey wash stain treatment, and sprayed the trestle base with Annie Sloan Chalk Paint in Old White. The trestle wedges match the table top for contrast and the whole piece will have a new life in their home. We’ll be building a matching bench for this table in the next few weeks. These are really fun projects for us to take on, so if you have a piece in your home or that a family member is passing on to you that isn’t quite right, let us rework it for your current style. We don’t have a before of this one, but it was very similar to the picture below. I recently breezed through Fixer Upper’s Joanna and Chip Gaines new book The Magnolia Story. I’m a fan of JoJos decorating style like many many other people, which must have influenced me to try a little something different with this tall chest of drawers that had been sitting in the shop for a few months. The original piece was a dark stain all over which wasn’t brining the trim details into play enough for me. Most pieces are very clear to me – I know pretty much exactly what I want to do with them the moment I see them, but this one came as part of a set that we refinished separately. We finally just gave it a fresh coat of Annie Sloan Antique White Chalk Paint and a coat of GF HP Top Coat, but I knew it wasn’t complete. I played with a General Finishes antiquing glaze called Van Dyke Brown and the brush strokes and moulding and dentil trim immediately came to life. This set had a carved wheat inlay that would have been lost without the glazing, but now it sweetly comes forward. There is a ton of depth in this piece, with light distressing and the glaze effect. I sourced some cast iron drawer pulls which really drive the Fixer Upper rustic farmhouse look home. I think every home need a piece of green furniture. 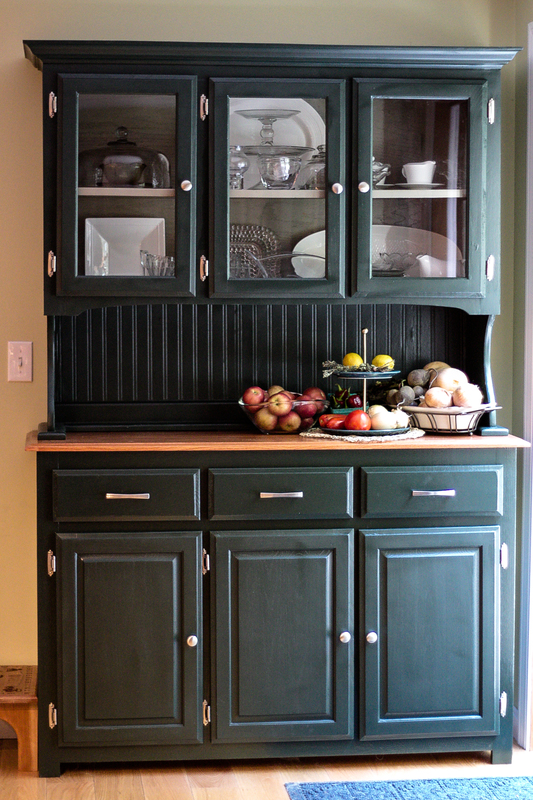 I love shades of green throughout – our kitchen is a light yellow-green, our bedroom is a serene blue-green, and the very first piece of furniture we painted is a deep rich green hutch with a metallic sage interior. I’ve been admiring the General Finishes Milk Paint hue Basil Green for a while just waiting for the right piece of furniture to hit the shop to play with it. This sweet antique 2-over-2 dresser with curves and a ladder detail is perfect for showing off this beautiful color. We balanced the design with just enough original hardwood woodgrain showing off which we brought back to life with Danish Oil. I sourced vintage glass knobs for drawer pulls to complete the look. I’m loving this in the office right now and would keep it if we needed one more piece of furniture in this house (fortunately for you, we don’t). This sweet antique telephone table came to us recently and I knew the delicate turned legs and lightness of the piece needed a special treatment. Brighter accents in homes are a current trend amidst all of our neutral-toned walls and kitchens that we are seeing. We refinished the top in a Early American gel stain and treated the bottom with a bright Patina Green milk paint which I toned down and added depth with a hand-applied glazing treatment. Let this vintage piece stand out and be an entry-way workhorse to catch mail and keys. A basket would fit perfectly underneath to catch junk mail for recycling. I was so excited to discover this long-neglected very rare vintage mid-century spider leg folding table base. This is a true 1950’s antique which needed some repair and refinishing to restore it to where we offer it today. It has a stunning curved teak folding 4-part base, a 30″ new glass top free from scratches set on soft casters and polished brass feet. There are not many of these available in existence and this one is in great shape for being nearly 70 years old. It will fit perfectly into a smaller living room space as a focal point that grabs attention, but doesn’t weigh the space down due to its elegant curves and weightless looking top. The few that we could find online are being offered over $1500 (https://www.etsy.com/listing/456854668/free-shipping-in-usa-mid-century-modern?ref=shop_home_active_30). We are listing this one at $500 for local pickup or delivery. Necessity is the mother of invention, they say, and in our case, refinishing a new kitchen hutch forced a relocation of our dogs bowls which moved them far from our previous food storage area. We custom built a dog food box/feeding station for our big guy Lagan and love these so much we’ve built some more. These feature a pull out removable plastic drawer with a handle which will hold 1-3 weeks worth of food depending on your dog. The plastic box liner can be removed for washing. This has a durable grey painted side and a varnished cherry top. The box nicely fits 2 bowls and we’ve noticed the raised feeding station slows our dogs eating down a bit and is much better for his digestion and posture as he ages. (Read more about that here: http://www.petmeds.org/petmeds-spotlight/the-benefits-of-an-elevated-feeder/). We also love that it keeps the water bowl off the floor with young kids around. You can add a non-slip mat if your dog loves to push bowls around the kitchen like ours does and that behavior will stop. The 8.5″ high one is ready to go home with someone immediately for a small/medium-sized breed. Talk to us about building a custom one if you have a larger or smaller dog. Vintage Toy Chest – updated! Happy Almost Spring – we are back in the shop after a little late winter hiatus with the birth of another daughter. We have TONS of pieces getting ready to be listed, so keep your eyes out as we post new items for sale. Today we have a vintage toy chest that came to us via a neighbor which got a beautiful durable grey-blue coat of Milk Paint and a grey-toned top which will upgrade any room or play space. We added a soft closing safety hinge to protect little fingers as this piece is solid wood and heavy. It will hold a TON of toys (or blankets, out of season clothes, etc etc). We can personalize with a name or initials!